"It is very interesting that I can get all Christian DVD movies in one place." Following the resurrection of Christ, through 70 A.D. Witness the trials and triumphs of the early church from the book of Acts! An outstanding follow-up, picking up where The Passion of the Christ leaves off! 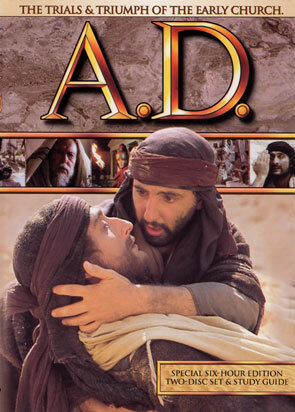 A Special Edition 6-hour, 2-disc DVD Set covering the years following the resurrection of Christ, through A.D. 70. Witness the trials and triumphs of the early church from the book of Acts! An outstanding film - picking up where The Passion of the Christ leaves off! Jerusalem, A.D. 30. Roman soldiers dismantle the cross. Later, Christ appears on the road to Emmaus. Saul persecutes the Church and Stephen supports it. Rejoice with Christ's disciples at Pentecost, cry with them at the stoning of Stephen. See the Church grow as Paul is dramatically converted, Peter performs wonders and Philip baptizes the Ethiopian. Finally, witness the great triumph of the Church despite persecution by Roman rulers and the martyrdom of Peter and Paul. This series comes with a Study Guide outlining a 12-week course of study - perfect for any Sunday school class or study group wishing to study the Early Church or the Book of Acts. Includes: Study Guide on disc. Format: DVD Region 1 - Fullscreen What's a Region Code? A journey into Proverbs with surprises around every bend. The film to introduce today's youth to Jesus. Go back to the roots of the beloved books of Laura Ingalls Wilder in this acclaimed miniseries remade by Disney. A 6-part series of Ken Ham’s most powerful talks, challenging the church to uphold the authority of the Bible in a scientific age. Simply awesome! I'm a Religious Studies Major in College and this film was a great adaptation of the start of the early church.